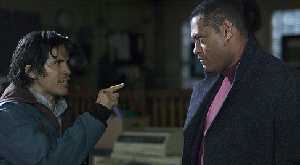 Cast: Ethan Hawke, Laurence Fishburne, Gabriel Byrne, Maria Bello, John Leguizamo, Brian Dennehy, Drea de Matteo, Ja Rule. Story: A remake of the 1976 John Carpenter movie sees a closing Detroit police precinct under siege. Nothing special here - a police station on its last night of operation is placed under siege. There's lots of shooting, lost of killing and lots of who-can-I-trust shenanigans. This time next year you won't even remember you saw it, but for an evening's escapism you could do a lot worse. I've a feeling this is going to be a pretty short review. There simply isn't a lot I can say without ruining the plot for you. I can say that the police station is under siege, because that's pretty much implied by the title, and I can say that it doesn't all go according to the Hollywood Rules for Scripts - I was most surprised by one particular turn of events - but other twists are carefully suggested by subtle headshots to help the audience feel smug that we saw it coming. Ethan Hawke is the man of the movie, we know that because he's in the opening scene that skilfully maps the character. Immediately afterwards, we are introduced to sassy psychiatrist Maria Bello and learn that Mr Hawke has some issues to deal with (surely not). Gabriel Byrne is Big Police Honcho Man who has just brought Big Bad Cop-Killing Ooze-Silent-Menace Guy Laurence Fishburne into captivity in the snowbound Precinct 13 on the last night of its operation before being moved across town. Well look at that, it turns out I could tell you quite a lot without ruining it after all. To be honest there isn't very much to say - it's an action movie and it works nicely, I don't resent paying six quid to see it but I won't be placing it on my you-gotta-see-this list. Laurence Fishburne's Morpheus-minus-morals performance is by far the most memorable, though John Leguizamo and Maria Bello both contribute beautifully judged characters. 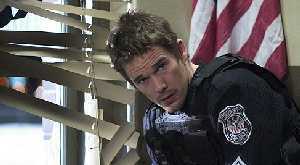 Ethan Hawke, while not doing anything wrong, is a little upstaged by his colleagues, but that helps to convey his difficulty in returning to real life-and-death police work (one of his "issues"). As the siege progresses, the story develops cogently and there is a real how-the-hell-are-they-getting-out-of-this-one sense as the tension mounts. Stories such as this one will never be totally believable, but Assault is pretty close. Each potential why-didn't-they-do-that hole is confronted and addressed, which really helps the watchability of the film. The ending is the only part that I wasn't comfortable with - it felt tacked on, as if not as much thought had been put into it as the remainder, however it didn't detract from what is a simple but effective action siege movie. Connoisseurs of the action genre, however, may be disappointed. Assault on Precinct 13 offers nothing new or particularly exciting - though teenage boys will appreciate the gratuitous shots of the knife-in-the-eye deaths - it's just a competently crafted tale with killing in it, so in a way it's an action movie for non-fans of action movies. Testosterone Satisfaction Rating: 3/5 Some gratuitously graphic violence, lots of shooting. To enjoy this film you should: Appreciate simple violent action.